Our Silentdoor range offer a solution to noise reduction for the areas where a higher acoustic performance is required than that offered by standard ‘off the shelf’ timber doors. Silentdoors are hand made to suit your requirements and available in a number of different finishes from primed to veneered and with furniture packages to suit most applications, ensuring that these comply with any standards (such as BB93) that may need to be met. Any other environment that requires sound reduction treatment between two areas. An acoustic door is a specialized doorset which performs far greater than standard doorsets when there is a necessity to reduce sound levels between two areas. Each door can be supplied with or without door furniture depending on your requirements. We can also fit your own furniture subject to an assessment being carried out to ensure it is compatible with our door design and suitable to ensure the door leaf is retained in position against the seals. 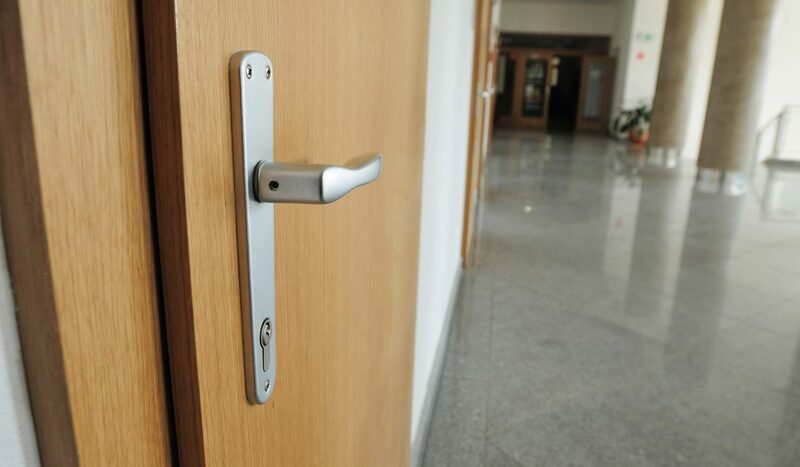 Each doorset is supplied to the handing required (position of latch or handle in respect to which way the door opens) and this applies to both single and double doorsets. Vision panels can also be incorporated in to the design of the door in conjunction with your requirements. All our doors can be manufactured to meet the requirements laid down under the Equality Act 2010 (EA) in England, Wales and Scotland with the Disability Discrimination Act 1995 (DDA) is still in force in Northern Ireland. Other sources of information that are available when looking at specifying doors are Approved Document M, BS8300 and many people still refer back to the DDA guidelines when looking at accessibility and doors although this has been repealed and superseded by the EA. See chart below for technical data and options available for our Silentdoor range. As well Silentdoor timber acoustic doorsets, H&H Acoustic Technologies Ltd can supply a range of acoustic flooring, comprehensive range of wall and ceiling treatments and acoustic materials to resolve sound reduction issues. 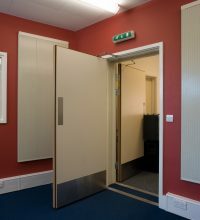 Description: SilentDoors are high performing doorsets designed to offer the additional performance that cannot be provided for by standard doorsets. These are hand made, bespoke internal acoustic timber doorsets that are supplied pre-hung using Grade 14 stainless steel hinges. SilentDoors can be supplied as single and double doorsets handed to suit specific requirements and supplied either as a primed, veneered or laminated to suit other doorsets where required and with or without door furniture.